Peter Simon, whom you likely don't know that you know, has been capturing moments his entire life. As the son of Simon & Schuster founder Richard Simon and the brother of even more widely known Carly Simon, Peter Simon has photographed his surroundings since his childhood. 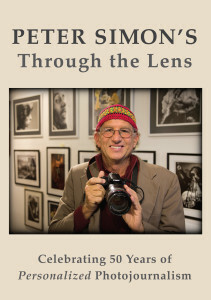 His life of photography, all 50 years of it, is captured in this wonderful two-disc, 240-minute collection called Peter Simon's Through the Lens, a collection he personally narrates and that includes such wondrous works as his coverage of the 1960's, his travels around the world, his coverage of many of music's true icons, and a more intimate look inside Simon's beloved Martha's Vineyard. A look at the section titles gives you tremendous insight into what to expect from Through the Lens. "A Look Into My Father's Eyes," "College Daze," "Street Life," "Country Comforts," "Decent Exposures," "Searching for the Spirit," and "Legendary People" comprise the first DVD while "Welcome to the Simon Gallery," "Reggae Bloodlines," "High and Dry," "So Many Roads," "OCCUPY!," "On the Vineyard," and "Bonus Tracks" add up to the second DVD. You end up with over 300 of Simon's photographs along with essays, insights and an informative Top 10 Most FAQ/Answers and Simon's Top 10 components of a great photograph. In his career, Simon has appeared in dozens of magazines and has published 14 books. This is his first DVD. If you come across the packaging, you'll be astounded by the packaging alone with its beautifully selected photographs and stand-out design. It's difficult to imagine anyone looking at it and not wanting to pick up the DVD. For more information on Peter Simon Through the Lens, visit Peter Simon's website linked to in the credits on the left of this review.